Locals and visitors alike will have the opportunity to become a scientist for a day. A wide range of research and tools will be on show at BIOS for the public to explore, from investigations of the ways climate change is affecting our oceans to studies of the microscopic plants and animals that live there, and from simple glass beakers to an ocean-going research ship. BIOS scientists will tailor their activities to spark the imaginations of visitors of all ages. Old favorites like wacky science, mini research cruises and the puppet show will run at set times throughout the day. BIOS’s remotely operated submarine will zoom around in Ferry Reach, controlled on land by members of the public. BIOS researchers will be on hand in the Ask a Scientist tent to answer questions about coral reefs, hurricanes, ocean chemistry, the marine environment, and what life as a working scientist is like. 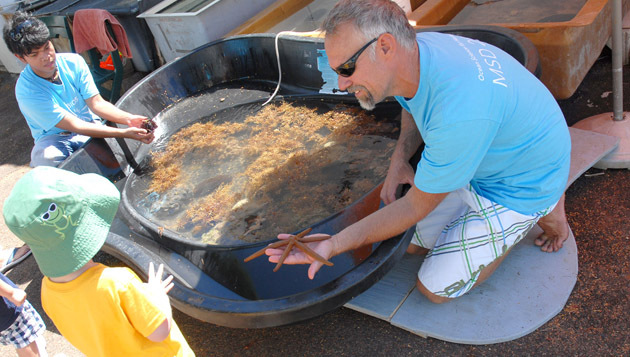 Marine Science Day will take place at BIOS’s Ferry Reach campus in St. George’s. Admission and parking are free. Hot food, snacks, drinks will be on sale throughout the day. Bring your re-useable water bottle for water.